Why is it that certain cars make people smile? Go out in one of these lovely little 500s for any distance and stop – for fuel, or a paper, or some food and I will guarantee someone will want to talk to you about your car. Add another 10 minutes chat time onto your journey times in the summer because you’ll need it! Is it the only car you can actually see through, around and over – that you feel you could physically give a big hug too, or even carry off home in a shopping trolley? What does it remind you of? Is this the ultimate definition of a cute car? Don’t get me wrong. Small is not always beautiful and there have been a lot of small cars etc. (i.e. the Sinclair C5) that folks would laugh at. Most people don’t laugh at a 500. Rather they smile with it. A bit like your new born baby, it’s small and perfectly formed. All the right bits in all the right places but… smaller, really smaller - only the 500 doesn’t usually need a nappy. May be it just instantly transports you back to times when cars were for pushing or picking up and nibbling. Re-visiting Noddy and Big Ears. Of course not all 500s are serene little runabouts. If you ever see one with its rear end lid firmly propped open I’d advise caution. This is usually not because the owner has gone mad and ordered a double portion of lunch, and now needs to fit the lunchbox somewhere inside, but due to a larger engine, possible linked to Abarth tuning products. In which case I’d suggest just letting it by! Just as a passing thought here, the first of the rear engined 500 weighed 470kg unladen - that's the same as a Caterham 7 Lightweight R500! Somehow, somewhere in the seventies and eighties people stopped looking at these cars as a form of rolling road block and started really appreciating the genius art and craft to them. Perhaps it happens when you can choose alternative transport, or when you want to make an extra parking spot or when modern electrics are aiding reliable starting. They’ve stopped being merely classic cars and become icons of our age. You can drive and smile again at the same time. It was a front engined, Type 500, 568cc 4 cylinder side valve, with water cooling and producing a princely 13bhp at 4000rpm. The engine was positioned in the nose of the car, ahead and below of the radiator with its cooling fan sitting above the engine. The vast majority of Topolinos were sold with a slide back canvas ‘folding roof’. After the first 46000 the rear suspension was modified to a semi elliptical design rather than the original quarter elliptical. The latter were described as Series 2 500s. Bumpers were an optional extra. In its final year of production, the 500B overhead valve engine was introduced, and by then over 122,000 Topolinos had been sold. The 500 B was mainly a mechanical development of the original Topolino, with improved brakes, telescopic shock absorber suspension and revised electrical equipment, in addition to the recently introduced 570cc overhead valve engine. The interior was changed too with a revised floor, steering wheel and new instruments. In the year and a half of production 21000 were produced. From September 1948, a four-seater station wagon version was announced. The Giardiniera Station Wagon’s body was based on the American designs with steel and plastic laminate sheeting around a timber frame. This car had a 5.2:1 final drive, higher than the 4.875:1 of the standard car. In March 1949, the C version of the Topolino was announced at the Geneva Motor Show. The car’s shape and styling were changed with headlights integrated into the front wings and a larger boot. An aluminium cylinder head was introduced. Heating and screen de-misting was also provided for the first time. The 500 C station wagon also proved very popular. Total production for the 500C was over 376000. This was a four-seat version of the original 500C, mechanically identical, and similar in size and style to the station wagon, but with an all-metal body frame replacing the wood of the Giardiniera. Composite panels were still used to save weight. The modern era for the Fiat 500 actually begins with this 600 and the 600 is often mistaken for the 500 that followed it. For the first time in this mini car series the engine is placed behind the car interior. Comparing with the later 500, the 600 can be spotted by its squared off rear wheel arch, longer bonnet sitting between the two front wings, and less curved body waist line. Overall it is the slightly larger of the two. Fiat had exploited demand for a small four seater. It was roomy for a small car, most of the body being used for passengers or luggage space. This was aided by Fiat’s adoption of a more modern single monocoque design with an integral body and chassis and all round independent suspension. The 600 was also offered at a lower price than the Topolino, although the 600 optional sliding roof increased its price by nearly 10%. The next model 600, the 600D was introduced in 1960, by then 950,000 were sold. In the summer of 1957 the now familiar shaped 500 was introduced to the world. It borrowed heavily from the design solutions Fiat had unveiled on the 600. 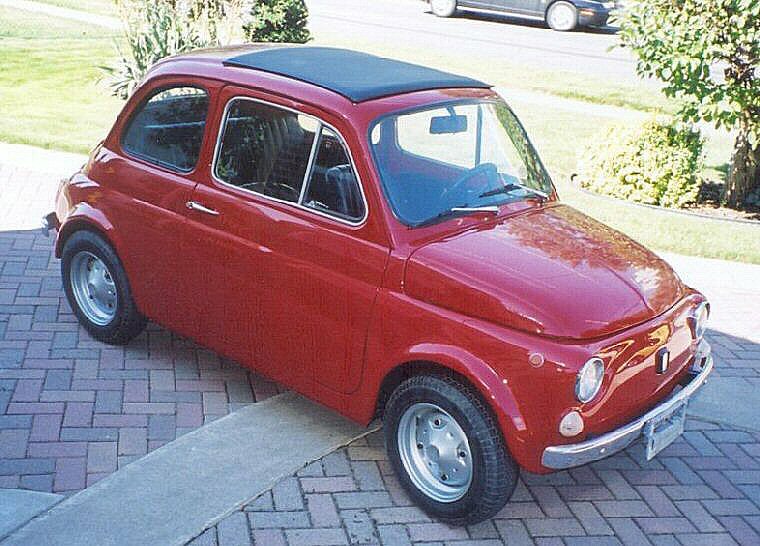 However the 500 is smaller in all dimensions and had Fiats first main line production air cooled 2 cylinder engine. Fiat launched a Sport version of the ‘Nuova’ in the summer of 1958, after entering in the Hockenheim 12 hour race – where it achieved a class win – occupying all the class podium places. The car’s power output was raised to 21.5 bhp with a capacity increase to 499.5cc. (47.4mmx70mm bore x stroke). The 500 waist line was picked out in a second paint shade, and for the first year no sliding roof option was available. In 1960 the 600 was updated. Engine capacity was increased to 767cc and power to 29bhp (type 100D.000). Performance was improved with a 4.85:1 final drive too. From 1964 the 600D was produced with front hinged doors and from 1965 the final series of the 600 also had a greater range with a 31 litre fuel tank, larger headlights and several bright trim badge and interior trim changes (from car no. 2035001.) By the time the 600 was withdrawn in 1970 production exceeded 2.5 million. Both Multipla and taxi forms of the 600D were also produced. The 500D was announced almost simultaneously with the 600D. The 500D adopted the same bore and stroke as the 500 Sport model it replaced. Its front and rear light lenses were changed, and a shorter sunroof provided. Internally the rear seat would now fold flat and the petrol tank was reshaped to give more room. The 500 was again updated in 1965, with mechanical and body modifications, to become the 500F. The most noticeable body alteration was the adoption of front hinged doors. Mechanically the F series had improved transmission, with stronger drive shafts, clutch and differential. In drive and performance there was little difference with the D series cars. In this basic body form the 500 was still in production over a decade later. By 1975 total production of all the 500s had exceeded 4 million cars. The body of this revised version retained the shape and look of the 500F. But the styling of the newly introduced Fiat 126 was echoed in the car’s wheels and bumpers – now devoid of over-riders. Frontal badging is also limited to a ‘FIAT’ logo. There are a lot of 500s around and a fair number of different series to choose from. The familiar shape you expect was first made in the 1957 Economy and Standard model. Suicide doors (rear hinged) continued until the 500F - first produced in 1965. The sun roof options have changed from full roof to small opening in the later series. Only the Sport version did not have a sunroof, although fibre glass solid roofs are available if required. Bodywork - there is virtually no part of these cars that is not a candidate for rusting. In particular anywhere exposed to damp or moisture is suspect - the floor and under sides, wheel arches, suspension mounts and engine bay need careful inspection. A dodgy MoT failure may be obtained for £600 - £1000. An average one for under £2000 and a good one for under £3500. Bear in mind to strip a car and bring the body up to top standard will cost between £3000 and £6000 - depending on where you go in the UK, and who you have do it. In other words its probably more economic to buy a good one first! Driving a standard one is going to be something of a culture shock. This is fifties 6 volt technology we could be driving here! Now you can feel the true rhythm of all 13.5bhp - and experience the delights of being burnt off by local lawn tractors and Volkswagen Beetles! So after you've thrilled to your first thirty car queue behind you waiting to overtake lets get it back in the garage and do something sensible..... like modification. Apart from the removal of the sunroof and roll cage installation for motorsport, the main consideration (on a sound shell) is going to be which wheels you choose. Because the wheel arches will need to be extended and rebuilt to cater for the new wheel size and offsets above 4.5J x 12ins rims (standard size was 3.5J x 12ins). Several of the old style mini 12ins options look good on the 500. Certainly look at the Compomotive, Superlite and Minilite wheels in addition to the Cromadora, and Lesmo. The latter is a copy of the original Campagnola wheel - used by Abarth in the sixties - and doesn't require wheel arch modification but they aren't cheap. For a normal road car look the other major body choice will be the bumpers. These range from simple replacements for the D F and R series chrome one piece, or the nudge bar addition used on the 500 Lusso. For an Abarth Replica expect to spend a further £1500 for the additional parts. One of the mods included here concerns propping open the engine cover. The sixties Abarths were converted to top hinges and propped open with a special frame. Alternatively fit a frame/clip that props open the lid using the standard bottom hinges. What about a real Abarth? They are in second mortgage territory! Acquire the engine and box from a 126. This 650cc engine is an evolution of the original engine and offers a stronger bottom end/ crankshaft and con-rods. These blocks can be over-bored to give greater engine capacity – a maximum bore under 80mm is recommended to avoid block cracking and flexure. Suitable piston sizes are available for 79.5/6mm bores giving a capacity of 700cc. If the original rev limits (5500rpm) are kept, then the standard rods are just about good enough. If a different cam and carb are chosen (with greater rpm) then it’s advisable to go for uprated rods. Above 6000rpm a steel crankshaft and main bearing housing are needed too. Lightening balancing and surface strengthening of the moving parts is crucial for revving and reliability. Which rods? There are several offered, perhaps the most note worthy being the Ferrari Dino V6 which can be tailored to fit. Which pistons? Not a problem. Several sources available. Above 30-35bhp output consider fitting a larger alloy (finned) sump from the later 126s to aid oil cooling and engine rigidity. The ultimate solution to modified sumps is the Abarth version. Also use under car ducting to help divert airflow into the front of the engine bay. Above 40bhp careful attention should be given to removing heat from the engine bay and the exhaust manifold. This is one application when exhaust wrap may be acceptable on the manifold. Fit an oil cooler. Accepted practice is to add a pumped system from the engine front cover plate. A cooler about the same size as the Uno Turbo is suggested as the oil temperature at this level of mod runs very hot. Head mods – over the years there have been many alternatives made. Both the block and head will need machining flat. You could consider raising the compression ratio at the same time. Chamber design isn’t brilliant on the standard items, so relieving the ports, gas-flowing the chamber and lightening the valves is important. Alternatively consider exchanging the head for one of the Italian 126 suppliers’ versions. The ultimate is probably a 126 Gozzoli 4 port head – but they are expensive. The Panda 30 head can be fitted too – but it is probably beyond a DIY/ local machine shop to achieve this and again there is a premium on the off-the-shelf ready prepared variety in the UK. Carburation and Cams – it is worth spending time and money on alternatives to the 500/126 carb. Middle Barton Garage (MBG) have championed the use of the Dell’Orto FZD for road cars along with a cam from the Sport (the standard manifold can be retained). You’ll be searching quite hard to find these carbs now. Electronic ignition – we’ve seen several versions, retaining the original distributor, including an electronic system from a FIRE 1 litre Uno , Lumenition Optronics, and even one system from a racing 2 cylinder lawn mower! In fact any reliable triggering system will do. The degree of advance in the distributor is ok for the Sport cam. For the racier Abarth cam profiles the advance curve will need to be increased and the distributor modified. MBG have recently begun using a simple PerTronix system from the States. Starting can be a problem with these engines and high output coils are available. Go for a four cylinder water cooled system from the 600 series! The ultimate here is the Abarth 1000cc engine. Of course this will mean quite radical alterations to the 500. You will definitely not be closing the engine lid again! Radiator and drive train need to come from the same source. Once you’ve made sure the tin worm is kept at bay – or bought a restored version, you can expect to have paid about 4 grand for the privilege. This route will double your outlay immediately! And then some more will be needed to make it look good. Alternative power sources we’ve seen include Italian and Lotus twin cams. Perhaps the most obvious Italian job might be the large engined Alfasud Boxer flat four – complete with its own rear engined drive train and suspension. Transplants at this level are not really commercially viable but please tell us of any you’ve really liked..... we'd like to take some pictures! Bike engines – because of the car’s light weight, the larger bike engines can be re-engineered to fit. We know of several, but unsurprisingly they are not widely seen away from their home range. They are virtually un-drivable for any great distance because of the noise and vibration. The Honda Fireblade or Suzuki Hyabusa or Moto Guzzi engines have been popular, but sources are drying up and scrap prices have been rising steadily over the past four years. The original four speed crash box (that's no synchro's folks - how's your double de-clutching going?) was designed to cope with 20bhp and equivalent torque. That's about the same torque as your neighbour's garden gnome copes with on his windmill in a gale. Still the noise should keep the moles away. Uprated clutches will be needed too. Obviously it makes sense to look at the the 126 box clutch and engine mods as a package. Different final drives and a 5 speed box are available at a price. Naturally LSDs and a variety of expensive cogs are available as well if your bank credit balance feels too large. (500s have been raced since the fifties). Clutch and fly wheel need to be uprated and lightened. Lightening the flywheel does a lot to the feel of such a small engine. The 1 litre Abarth comes with its own gearbox and transmission. See the bank manager again. Suspension – budget to start again. Check to make sure the suspension components are not broken or bent. The accepted route for road cars is to obtain a reversed eye leaf spring for the front suspension. (The bush eyes are located above the main spring line rather than below it as per standard). This lowers the location of the front uprights without compromising front suspension travel. The leaf spring is usually de cambered too. Together this lowers the car about 35mm. At the rear the 35mm is achieved with lower, stiffer coil springs. Choice of uprated shock absorbers is available too. About 1 degree of negative camber is built into the front upright suspension mounts by ovaling the top mounting holes and welding in washers at the new position, and matching the top mount shims. Lowering the rear springs by 35mm has the effect of changing the rear camber to about 0.5 degrees negative too. Renew all the bushes but retain the standard toe-in values. For normal road work and a lightly tuned car, the standard drum system is probably adequate providing it is in excellent condition. Their problem is brake fade - at higher speeds and heavier use there is no way to dissipate the heat - hence fade occurs. The best value route is to consider later Fiat brake systems with front discs. But then the choice of wheel, wheel offset, hub and none standard look needs to be considered at the same time. An alternative is to fit brake kits already tailored for the car in this case you won't have much change from £1000. You may have noticed the interior is somewhat devoid of instrumentation. Try starting with Middle Barton Garage's binnacle, gauges and sender pack. Warning lights, fuel gauge and rev counter are a good starting point. MBG also offer German sourced seats and controls specifically designed for the 500/600s. I can't guarantee you won't get back ache on longer runs though - the ergonomics of driver positions and controls was still in its infancy in the fifties. • In London R Proietti Ltd and associated parts and advice. • Middle Barton Garage at Chipping Norton near Oxford. Abarth and 500/600 specialist with modifications and Abarth parts galore. Very much in the Abarth tradition very capable. Also do a large catalogue for the 500/600 range. • Guy Moerenhout 'does' Abarths in a big way. And his 500/ 600 offerings are extensive! • Deep in the heart of Detmold Germany is part of the Holtmann Niedergerke Group. For the 500 and 600 they can be very useful indeed! There are second hand spares available sometimes too. They should be on your shopping list. H&N Online Shop they are in the process of extending the online spares list here. Local retail outlet is Gettingman & Niedergerke on +49 (0)5231/6179-0. Wheels - sort your rim choice before restoration - it affects too much else. • Minilite are being made by Tech-Del Ltd in Taunton with 10",12" or 13" rims in magnesium alloy or aluminium. Very similar patterns to the originals.